Scene: Dining room table, happy music plays in the background. Father opens container to find a smashed, nasty, dried out cheeseburger. Music stops. Mother opens her fish sandwich to find it swimming in tartar sauce. Cut to refrigerator. *thump* it moves. 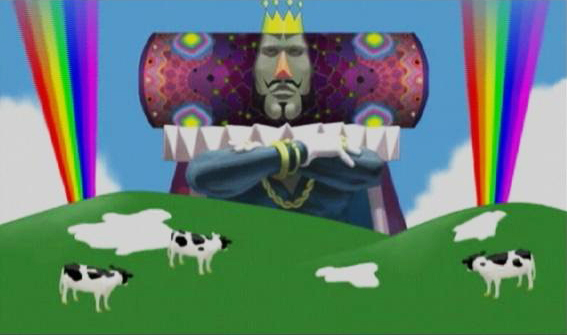 Refrigerator door opens and a rainbow spin of colors comes out, revealing someone like the Katamari King. scene cuts change to an old japanese fight movie. In his hands is a small microwave which shoots burritos out like a tommy gun. Steaming burritos land on plates that magically appear in front of them. “Thanks burrito overlord!” the family cheers in unison. Camera cuts to burrito overlord who gives a two finger salute, before jumping, spinning into a rainbow and zapping back into a freezer. Happy mexican celebration plays while the family digs in. I’m not sure why the idea hit me, but my brain has focused on it and it won’t let me move on until I write it down. When afflicted, a goat appears from nowhere and proceeds to follow you around, constantly bleating. The goat is immortal, never sleeps, and cannot be lost. It will keep you awake, give away your position, and generally be annoying. If pushed off a cliff or otherwise separated, it will reappear within minutes, often headbutting the afflicted from behind. Curse of the Golden Goat – The only way to silence the goat is to feed it gold coins; a gold coin will by you 10 minutes of silence. Curse of the Ghost Goat – The goat is incorporeal. Can’t be locked in another room, can’t be used to wedge a door closed, and spooks living animals. Curse of the Silent Goat – It doesn’t bleat, it just stares at you and makes you feel bad about your life choices. Seen as an ill omen.